Unique opportunity to own your own castle! This elegant 9,400 sf masterpiece with 7BR/6.5 BA located in the prestigious & gated community of Old Kinderhook is now on the market. This one-of-a-kind property was designed and built by the developer and sits on two premier lots at the highest elevation in the community and provides the most picturesque views from every room. A cascading waterfall greets you as you drive up & the 85 acres of common ground that sits behind the home is surreal. 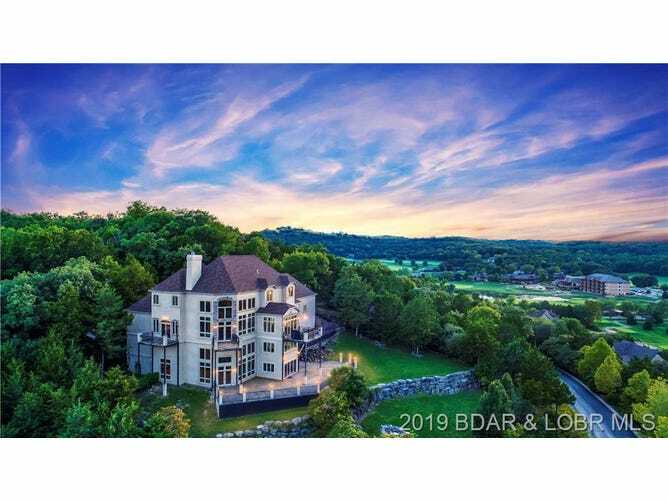 The interior features an Italian marble entry, marble staircase, a basketball court, movie theater,  gourmet kitchen, 2nd kitchen on the first floor, conference room, library, cherry wood elevator, wine room and much more. The manicured grounds provide a unique combination of extreme privacy and are a quick golf cart drive away to the private marina, Tom Weiskopf golf course, driving range, putting green, spa, fitness & business center, 3 pools, tennis courts, restaurants and an ice skating rink. Legal info: Lots 22 & 23 PT SE1/4 Old Kinderhook Plat 2, Camden County, MO. Exact legal on file to govern.